COMPATIBILITY: These connectors are compatible with all standard oxygen tubing including all of the Oxygen Supply Tubing available on this site. They work perfectly. Will reorder more if needed. This type i9s better than others as it has a little tab in center. This makes all the difference to comfort. I have purchased supplies before from HMS and have always been totally satisfied. Their support agents go the extra mile and the delivery is amazingly fast. 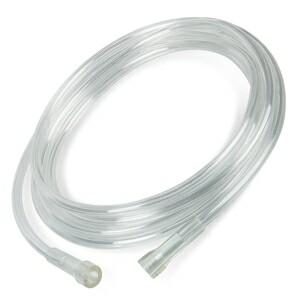 As advertised, tried to get 2 foot canulas from my oxygen provider here in Florida and they don' t have them got them and connectors to alter the 4 foot ones from here. Was just what i needed, at a great price!ordering was easy and I received product very quickly! Simple, inexpensive O2 tubing connector. Quick shipping. Has a nice tight seal and works great with the tubing that I purchased from Direct Home Medical. Will recommend and purchase from you again. These little connectors are essential to have available. The description says the item is a tubing connector, but there actually has to be a connector fitting on each end of the existing tubing for this to work. I needed an actual tubing connector that can be inserted into the tubing itself to reconnect lines that don't have connectors. By the say, technically, this is a coupling, "a device that serves to connect the ends of adjacent objects," not a connector. I use two twenty-five foot tubing with one of these connectors. I couldn't do without this product. exactly the same as they used on me in the hospital. Great quality and excellent service. Satisfactory, quick delivery, good service. arrived on time and was what i needed. thanks. These connectors were exactly what we needed! They arrived very promptly and we were delighted (I still have not received the ones ordered from our local oxygen provider). I have always been exceptionally happy w/ Direct Home's services. There has never been an issue regarding anything I have ever ordered. I do recommend this company. A step above any other company that I have come in contact w/ .. I have mostly purchased tubing, canulas & connecters. SUPER FAST SERVICE, GREAT PRODUCT, WILL CONTINUE TO ORDER FROM YOU.